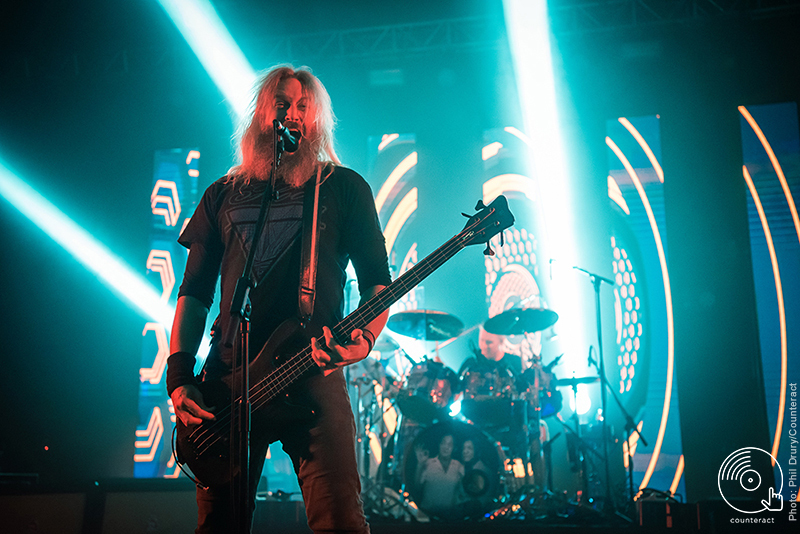 Kicking off 2019 in awesome form, Mastodon took to the stage of Birmingham’s O2 Academy on the night of the 22nd. Looming like fearsome titans on the foggy stage, they conjured bolts of crushing metal and melody to impress an awestruck crowd. Support for the night started with the mighty Mutoid Man. Making sure to blast any expectations straight out of the water, they kick things off with the opener to 2017’s War Moans: aptly titled ‘Melt Your Mind’. The set maintains a thrashing pace as vocalist Stephen Brodsky howls and shows off his impressive vocal range. Ben Koller annihilates the drum kit like a four armed monstrosity and Nick Cageao delivers pummeling basslines throughout. At some particularly busy moments during songs, the mix seems slightly off and the vocals get lost in the sheer volume of everything, but it doesn’t detract much. The set comes to an end with the band’s biggest hit, taken from 2015’s Bleeder: ‘Bridgeburner’. An extremely solid start to the night. Not wasting much time, Norwegian black’n’rollers Kvelertak make their way to the stage with an undeniable energy. Boasting three guitarists, they make the point of never slacking on volume and ferocity and this is startlingly clear from the opener, taken from 2013’s Meir: ‘Åpenbaring’. 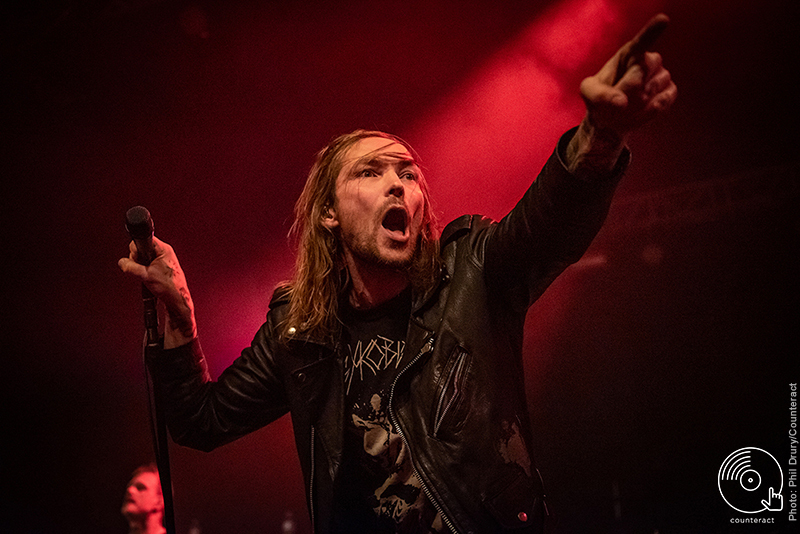 Clad in a leather jacket and a range of comical expressions, new vocalist Ivar Nikolaisen cements his place at the helm of the savage and mighty Kvelertak (Norwegian for “stranglehold”). They close out their set in style with their eponymous track ‘Kvelertak’ and frontman Ivar retrieves a gigantic flag with their signature owl sigil on it, and waves it triumphantly as the final melodies blow the crowd away. Having recently supported Metallica on an arena tour, their performance really is one of the best out there right now. 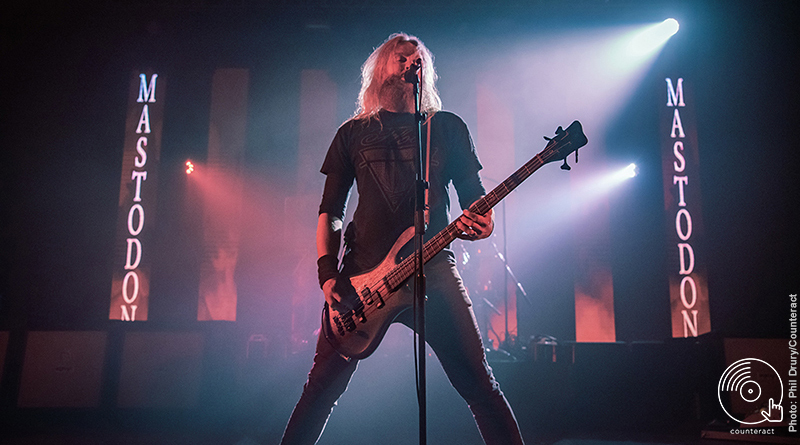 A must see band for fans of anything from rock’n’roll to the most extreme metal. Soon, the stage darkens once more, and Gene Kelly’s ‘Singing in the Rain’ begins pouring from the speakers. The crowd sings along heartily, and collectively loses their minds as Mastodon stomp into position. ‘Iron Tusk’ ruthlessly tears Gene Kelly’s classic in two and thrusts the room into a chaotic frenzy. Razor sharp riffage from Brent Hinds and Bill Kelliher, guttural bass from Troy Sanders, and thundering drum work from Brann Dailor. 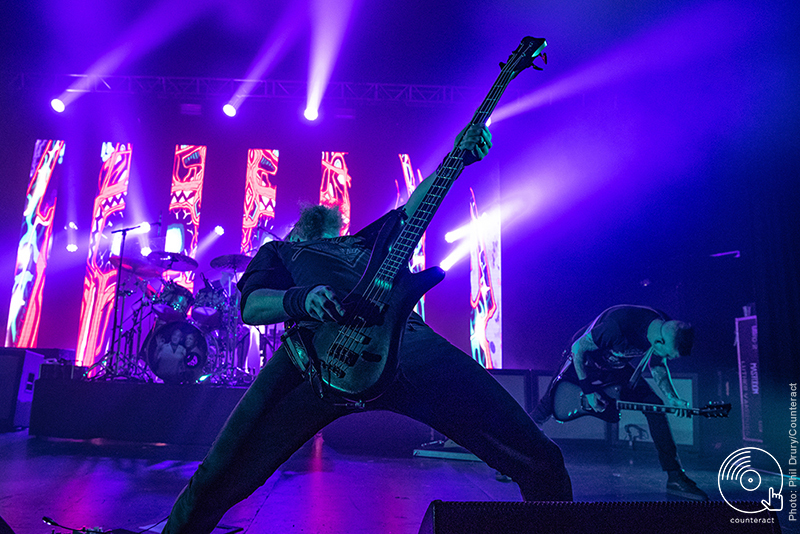 Together they form the mighty Mastodon itself, violently stampeding through a showcase of their catalogue’s finest moments. ‘Mother Puncher’ is a standout moment from the early set, taking the room back to 2002’s Remission album. After some older songs, comes a wide plethora of newer material from Emperor of Sand, Cold Dark Place, and Once More ‘Round The Sun. 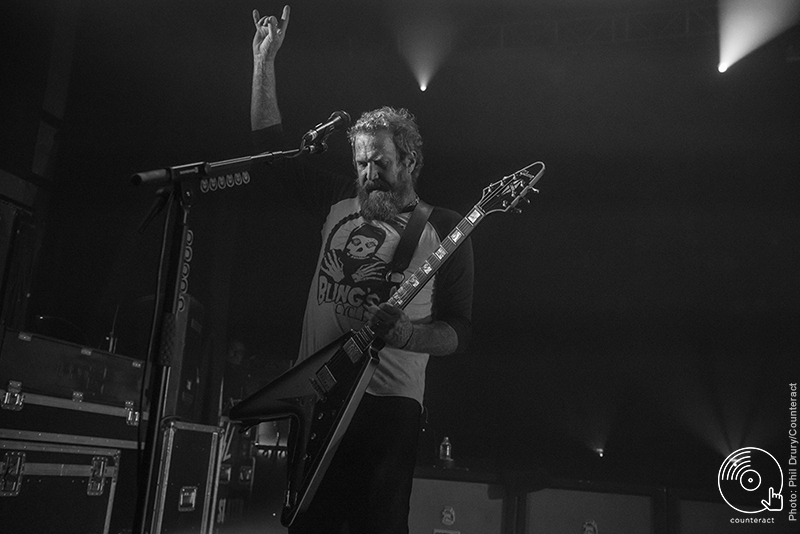 The crowd reacts with incredible energy no matter how old or new the material, which proves how Mastodon continue to be hugely relevant in the metal scene, maybe more now than ever. 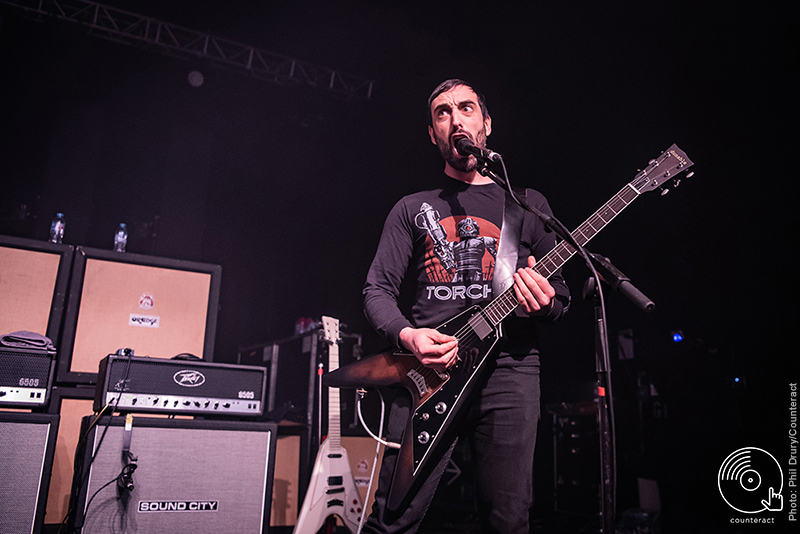 Troy makes a comment about Birmingham being “the legendary city of metal” and announces that for the last third of the set, Scott Kelly (frontman of Neurosis) will join Mastodon on stage to sing Brent’s parts with a welcomed ferocity. Highlights toward the end come in the form of ‘Crystal Skull’, ‘Crack the Skye’, and the inevitable finale: ‘Blood and Thunder’. Yet another incredible night for metal in Birmingham, with all three bands putting on exceptional performances. Nick Cave fan. Video game competitor. English graduate. Photoshop boy. Nick Cave fan. Video game competitor.